The book first underlines the importance of marketing to almost every facet of politics before providing in depth analysis of practically every aspect, including: voter targeting, database management, social media practice, celebrity endorsement, fundraising, branding and advertising. As well as codifying a vocabulary for discussing the discipline, the authors have also created a particularly useful matrix (featured above) which outlines all the political marketing activity that a campaign can and should undertake. Many successful political operators have a good natural instinct for political marketing activity or through experience have picked up that many of the methods are crucial to success. But I wonder how many political campaigns have a singular marketing chief who has these tasks written into their job description. 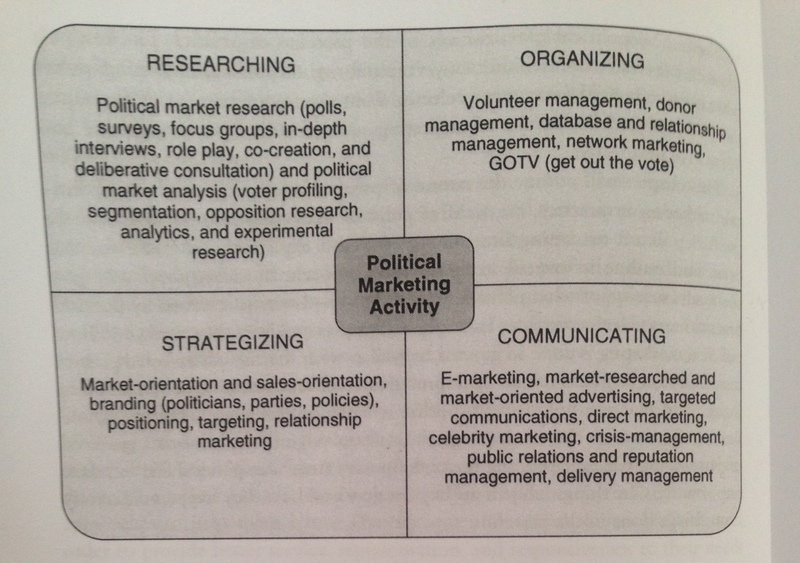 If I was running a political campaign, the authors’ political marketing matrix would be the ongoing basis for my ‘to do’ list and the blueprint for structuring my organisation.